The Real-Time Insights on AWS Account Activity solution dashboard displays a default set of metrics, but you can customize the dashboard to include any metrics from your AWS CloudTrail logs. Follow the step-by-step instructions in this section to add a metric to the dashboard. 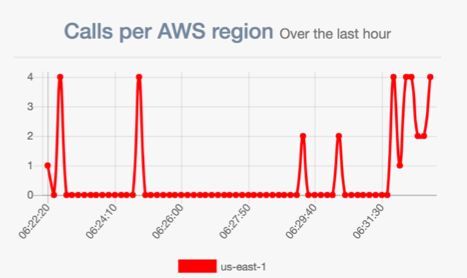 For this exercise, you can add the awsRegion metric in the CloudTrail event. Use this procedure to update the source schema with the new metric. For information on using the Schema Editor, see Working with the Schema Editor in the Amazon Kinesis Data Analytics Developer Guide. If the custom metric is already added to the Amazon Kinesis Data Analytics application’s in-application input stream, skip to Step 2. Sign in to the AWS Management Console and open the Amazon Kinesis Data Analytics console. Select the RealTimeInsightsAccountActivityApp application from the list. Under Real-Time Analytics, choose Go to SQL results. On the Source data tab, choose Edit schema. For Column name, enter awsRegion. For Column type, enter VARCHAR. For Row path, enter $.detail.awsRegion. Choose Save schema and update stream samples. To verify that you added the metric correctly, choose Go to SQL results and verify that the Source data tab shows the new column (awsRegion) and an applicable value. Use this procedure to update the application’s code with the new SQL statement. For information on using the SQL Editor, see Working with the SQL Editor in the Amazon Kinesis Data Analytics Developer Guide. On the Kinesis Data Analytics application’s SQL Editor page, select the Real-time analytics tab. SELECT STREAM STEP(cloudtraillogs. "eventTimestamp" BY INTERVAL '10' SECOND) as eventTimeStamp, COUNT(*) callsPerRegion, "awsRegion"
This SQL statement creates a new metric (CallsPerRegion) that stores the number of API calls per AWS Region with the associated region value in the Amazon DynamoDB table. Select Save and run SQL. Upload the modified dash.js file to the solution’s Amazon S3 bucket. For this exercise, add the bold HTML element to the dash.html file. After you upload the modified dash.html file to the Amazon S3 bucket, open the dashboard in a browser and verify the new chart shows metrics.